When I came home from work tonight and opened the kitchen door, I heard the oil burner running in the cellar and felt the warmth that it produced from my 90-year-old radiators. A glance at the thermometer on the back porch verified that it was cold. 10 degrees cold! As much as I complain about the cost of oil and about how much of that black gold it takes to keep my house warm, having the warmth waiting for me tonight was far more important than the dollars going up the chimney. Having awakened several mornings during the past two weeks to a 50-some degree house caused by burner trouble got me thinking about how lucky we are to live in times when central heating and toasty indoor temperatures are taken for granted. When my house was built, sometime between 1830 and 1840, central heating didn’t exist and people kept from freezing by using inefficient wood-burning box stoves (the early Methodist church had the first box stove in Andes in the 1820s) and, in the older homes, even more inefficient fireplaces. 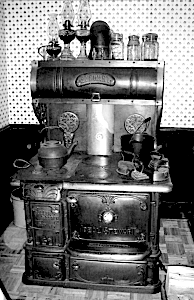 Stove designs saw many improvements over the next six decades, but still provided localized heat that cooked you on the front and froze you on the back, leaving the perimeters of the rooms and upper stories frigid cold. Stoves were not airtight like modern wood stoves and fueling had to be done every couple of hours to keep the fires going. Most homes had multiple stoves that were fired up, as the rooms they were in were needed. At one time my house had 6 stoves used to heat the entire house although I’m sure that they were not all used at the same time. The kitchen stove was the heart of almost every home—cooking and baking the family’s food as well as keeping the kitchen warm and providing hot water for cleaning and bathing. Many people’s winter existence was centered in the kitchen around that stove. Understandably, many cords of firewood needed to be cut, stacked, and seasoned before it could be used as a safe fuel source. Farmers had woodlots (stands of trees used primarily for fuel) but those who lived in town had to purchase their wood and had their homes surrounded by woodpiles. Those who used green (wet and unseasoned) wood for fuel would build up creosote in their chimneys which, if left uncleaned, would ignite and burn intensely, often shooting flames for several feet in the air. This not only posed a serious fire hazard for the rest of the house at the time of the chimney fire, but the intense heat generated could damage the flueless chimney, rendering it unsafe and prone to setting the house on fire during future uses. The January thaw would provide an opportune time to let the fires go out and for the stovepipes and chimneys to get cleaned. Longtime resident Marguerite Fowler (1891-1994) told a story about burning green wood. Back in “olden times” when school authorities didn’t worry about getting sued-for every decision made or not made, the boys in the older classes were responsible for keeping the fires in the school buildings going. The old Andes High School, located where Kathe Reale ’s home is now, had several stoves on two floors used to heat the large structure. One cold winter day (probably around 1900) the boys decided that they ’d had enough school for one day and during the lunch break filled all the stoves with green, wet wood. It didn’t take long for the stoves to produce so much thick smoke that the chimneys couldn’t handle it and it spilled out into the building. School was cancelled for the afternoon! When the Delaware and Eastern Railroad came to Andes in 1907, a new fuel source was introduced: coal. This even, long-burning fuel could now efficiently be transported to the yards in Andes where it was sold in quantities easily transported to homes and businesses. It was about this time that people began to install central heating furnaces in their homes, although many folks were still burning stoves well into the 1940s. The earlier furnaces burned wood and usually consisted of one large register located directly above the furnace —they were called “pipeless” furnaces (the Bruce Mansion and the Presbyter- ian church both had these “pipeless” wood burning furnaces in the 1880s.) Parlor stoves and kitchen ranges were both now outfitted with grates that would burn either wood or coal, and even heat could now be provided for every home. The Winter of 1914 brought a huge snowstorm that blanketed the entire Catskill region in several feet of snow, with the Andes area being particularly hard hit. The D and N railroad was pretty much shut down and coal deliveries to Andes had stopped. The supply had dwindled and I ’m sure that some homeowners without access to an alternate wood supply were seriously thinking about burning the furniture to keep warm! The tracks were finally cleared and the coal deliveries were made. Andes was saved! Coal furnaces and boilers produced wonderful, even heat in the dead of Winter, but would “drive you out” in Spring and Fall when outdoor temperatures soared during the day and plummeted at night. I heated my home with the original 1930 coal-fired boiler until high coal prices and dirt finally persuaded me to install an oil-fired boiler. I currently have a working 1915 cookstove in my kitchen, mainly for aesthetics. Although I enjoyed the coal burning experience and certainly revel in the warmth of the stove (which I affectionately named “Uncle Linn” since it came from the Linn Bruce mansion,) I appreciate modern times and technology every time I hear the oil burner kick in!